Please forgive me in advance for ruining the look of my Ballad. I would like to add a swim platform with a permanent folding ladder, a location for an outboard, and update the sail plan to 508 ft^2(47 m^2) See attached low res screen shot. To keep the CE in the same place, it looks like it means a 220 ft^2 (20.4 m^2) main - meaning that the new boom length is on the order of 13.5 ft (4.1m). I will add a boom gallows to support the boom (not yet in the drawing). I would like to get away from the main roller reefer/furler for this size main. Here is my question: For those who have made the conversion away from the roller boom, which system for the gooseneck attachment have turned out well. I am trying to get the light air on the wind performance up, not for racing but to be able to sail in lighter air. Any thoughts on the performance impact would be appreciated. Hi Ted. We have vague plans for a similar mainsail increase, and many many IOR-era boats have been modified this way with good resilts. 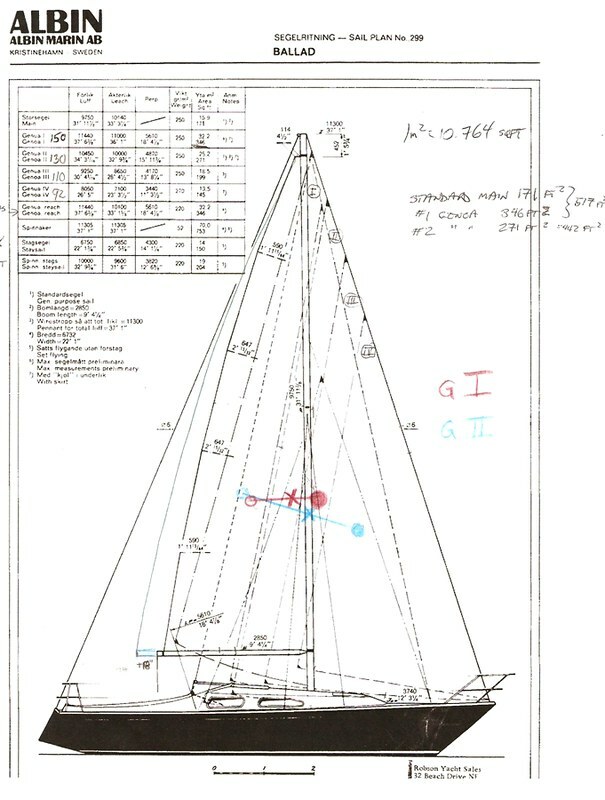 As your drawings show, adding foot & leach to the main does not really upset the sail balance at all if combined with a smaller genoa; so much of the 150% G1 is behind the mast anyhow, that reducing it to ~135% and upsizing the main does not appreciably move the center of effort at all! I figure we could add 18" to the boom without upsetting things. Instead of a gallows, have you considered the combination of a rigid vang (or Boomkicker) and lazy jacks? They have the added benefit of holding up the boom & containing the sail while reefing or dropping sail from the cockpit. I haven't had a great deal of luck finding goosenecks, but they can be pretty simple & are easily fabricated. Nearly all the force is compression. This plan allowed me to nix the planned boomkin and the new sail out on the bowsprit will be something like a code zero or genaker type sail. I will likely have to reef the three reef main to the first reef when I drop or furl the code zero just to maintain some semblance of helm balance. Thanks for the thoughts on the vang, I have not worked out the control or the reefing system of the main completely yet, or rather how much I have to change/improve but it needs to be easy because I will be reefing often for sure with all this. I have no really useful input to the topic in general. But I would be curious to know what kind of a boom you bought? My gooseneck is in a somewhat sorry state and I am looking into replacing it, while simultaneously increasing the length of the boom / changing the sail. What are your current thoughts on the mainsheet setup?